Another Buddhist retreat of Tenerife Yoga and meditation centers? Do 10 top Buddhist retreat features turn Sunset beach 290 into more? The Tenerife Buddhist retreat called Sunset 290 seems to be the non plus ultra of Buddhism in Europe. It's not an official retreat. News 2016 regarding Sunset 290 A couple of local newspapers of 2016 talked about its illegal building on public spaces. However, the highly popular excursion place of over 42000 Facebook likes has affirmed that it wont close its doors now nor in the next future, as it holds an authorization. Sunset 290 doesn't invite to go there for Yoga, meditations or Asian treatments, as is the case at other Tenerife centers which have sprung up. However, what keeps you from going there to meditate? All the Buddhist symbols are there. They are ideal to get you into the right mindset. 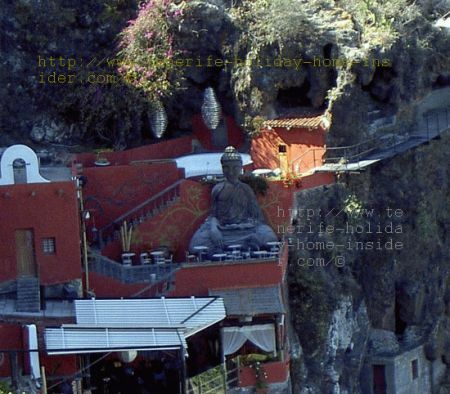 Its stage for the most understated Buddhist temple or shrine is in Tenerife North in absolute breath taking country. This simulation of a 'Buddhist retreat' is a dream sanctuary come true of a magic composition which would look great in a movie or in theater. Notice the divine light where the afternoon sun found a spot to reflect itself within volcanic rocks! Certainly, it seems to be a location which is dedicated to the philosophy and teachings of Buddha despite its nearby bar and restaurant services. Also, contrary to many an Asian Buddhist temple, no luxury, glitter, gold and glamor form part of it. All fits most naturally into a volcanic, almost black mountain landscape. Sunset Beach 290 and Buddha? It's at the oasis Sunset beach 290 of La Orotava. This resort is about ten minutes by car from Puerto de la Cruz or twenty minutes from Los Realejos. The Buddhist retreat is very close to the Tenerife beaches Orotava called Playa Bollullo, Patos and Arcón which are the most treacherous seashores to swimmers on the island's North coast. The Buddhist scene forms the background of Sunset beach 290 and is only topped by Mount Teide on the horizon behind it. Without any doubt, it gives you the most authentic looking composition of a Buddhism center in the whole of Europe. Vista Paraiso is a new coastal settlement where some lavish villas of extravagant Hollywood style nest in hills above the sea. 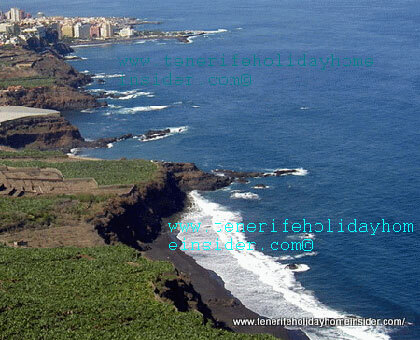 The location is not far from Santa Ursula and the Humboldt look-out of La Orotava. Turn sharp left into Calle Vista Paraiso. Drive parallel along the free way straight all the time. There is a large board by the bridge by the TF5 which reads Vista Paraiso and points to the direction to take. There, spot part of the magnificent Orotava valley with Mount Teide on its horizon..
Don't turn right on the bottom but drive along a very high natural stone wall and get to a wooden signpost in front of a Canary palm. It gives you opening hours of Sunset Beach 290 from Tuesday to Sunday 5 p.m.-2.a.m, as depicted beside in Spanish. The hill going down looks awesomely steep. However, several cars made it down there, when I was by its top last time. In fact, the incredible Buddhist retreat setting forms the back stage of relaxed night life at Sunset Beach 290. Building works on the side promise more surprises to come, if not mistaken. What about Sunset beach 290? 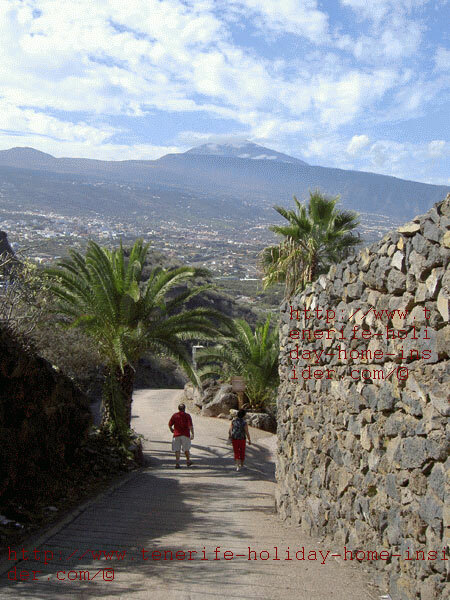 The natural stage of Tenerife Mount Teide and its Cañadas are said to be a virtual Buddhist temple for many members of Tenerife Buddhism. People of the Buddhist association at C/ San Agustin, 38, 38410 Los Realejos, whose regional town information find by clicking here, get together that way on week-ends, to the best of my knowledge. There is a cellular phone number. It's 0034 + 617 8659872 for Spanish speakers only. Usually, there are Buddhist seminars in winter at the convention Center of Puerto del Cruz at the former Casino Taoro. Unfortunately, they are only published online by the names of their Lama teachers or affiliations. The European Network of Buddhist Christian Studies (whose existence proves that Buddhism is not a religion) announced the next conference of 2015 to be in St.Ottilien more of which find at Buddhist Christian Studies. Check out the very near Cafe Vista Paraiso which also has a link to an excellent road/hiking map for the Bollullo region. From Buddhist retreat back to Tenerife attractions, full of surprises, indeed.